Rest of Saturday: Clouds increase. Highs in the 50s. Saturday Night: Mostly cloudy. Lows in the 30s and 40s. Sunday: Mostly sunny, windy. Highs in the 30s and 40s. The weekend will start on a mild note, with highs reaching the 50s for many across New England on Saturday. Sunshine will be most widespread near the coastline, while clouds creep in from the west ahead of a cold front. 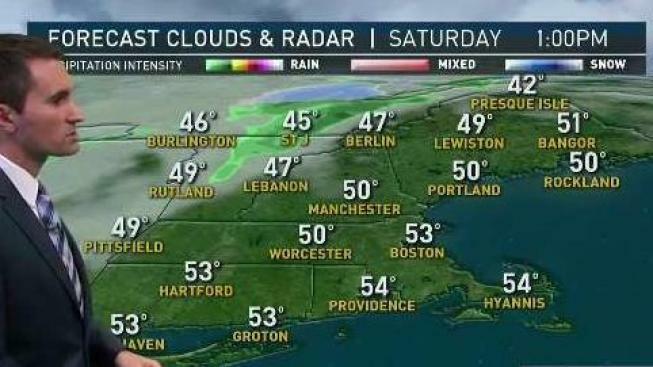 That front will trigger a few Northern New England showers Saturday, but that’s really about it. The bigger impacts from that front won’t be felt until Sunday, when highs only top out in the 30s and 40s. A gusty northwest wind will make it feel even colder than that. Snow showers will be found over the mountains of northern and western new England, but for most we’ll see chilly sunshine. The early part of the new workweek also starts cool and quiet, with highs in the 30s and 40s. Another brief mild stretch of weather arrives mid-week, with a few 50s back, before our next chance of wet weather holding off until late week.